I do not know how many times Jerry (the white gerbil) escape from the tank. This little trouble maker gives us trouble all the time. He likes to chase all the time. He hides underneath the refrigerator, oven, or anywhere that he can fit. We often catch him with a net. Finally, my husband goes to Wal-Mart and buys a tank cover. Jerry is now behaving. He never escapes since my husband bought the tank cover. They both can breathe because there are many holes. I do not know what takes us so long to buy this tank cover. I am linking this entry to 366 of Blog Photo Challenge. 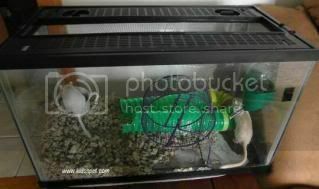 This entry was posted in accessories, gerbils, pets, store and tagged 366 Blog Photo Challenge, tank, tank cover, Wal-Mart. Bookmark the permalink.